The exterior of the Reppie waste-to-energy facility in Addis Ababa. 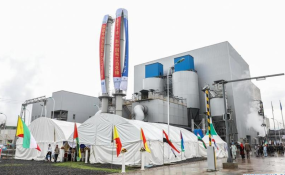 Ethiopia's first waste-to-energy facility was inaugurated on Sunday in the presence of high-level Ethiopian and foreign dignitaries. Ethiopia's first waste-to-energy facility was inaugurated on Sunday in the presence of high-level Ethiopian and foreign dignitaries. "The Ethiopian government hopes with the commissioning of this project it can turn an increasing urban rubbish menace into an economic boon," he said. Zhang Yanfei, presidentof CNEEC, said the waste-to-energy facility is one big step forward to make Addis Ababa, a city with a population of over 4 million, clean and healthy.